Ever since my childhood, I used to be good. My parents raised me so. I lived in a cave near the village, where playing children visited me. And I enjoyed it. But then heroes visited the village. When they first came to me and pulled their sword out, I thought, that we will be playing soldiers. I was imagining them attacking me and then laughing it all together. But first blow disconcerted me wrong. I was struck into my elbow and not only pain ,but also rage, ripped through my body. Uncontrollable rage. These people did not come to play! Since then, relations with neighboring villages have changed. Children hear only ghostly tales from their parents about me and I suddenly have no friends. Bored, then these monsters cast drift of beautiful virgins. They do not want them for woman, they just want to talk. But their parents do not understand and send heroes to save them. 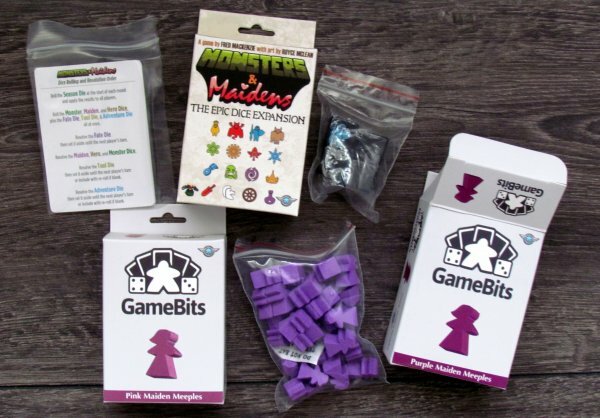 And look, now we have a plot for a simple dice game Monsters & Maidens, prepared by Fred Mackenzie with company Clever Mojo Games behind excellent Alien Frontiers (review). 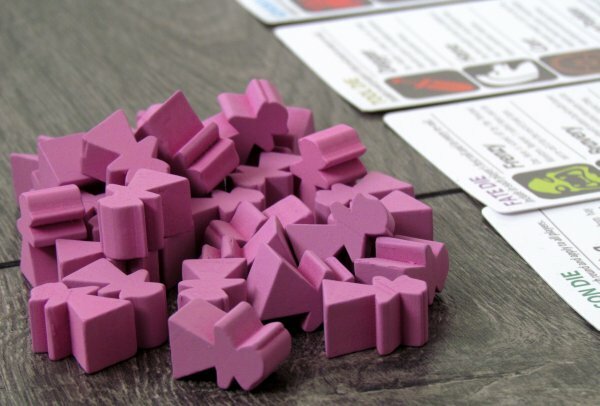 It all came out in production of Game Salute and Kickstarter. 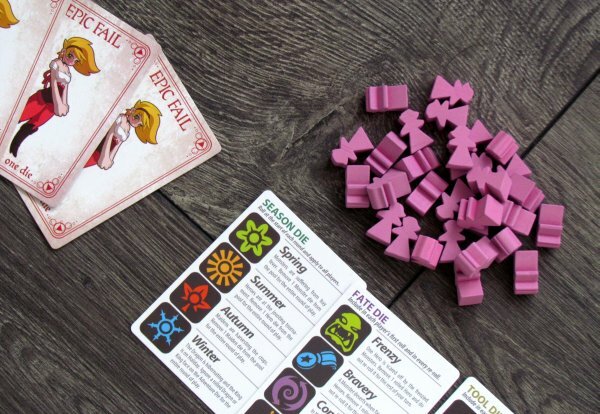 Game was released after the successful campaign in 2014 with illustrations by Royce McLean. The entire age-old battle between monsters, heroes and virgins (which have also something to say about the fight) takes place in a small white box. Now here is already seen from the maiden posture, that this will be a tough nut to crack. Inside, there is waiting for us only a small folded rulebook, a stack of nine colored dice and a package of seven cards. 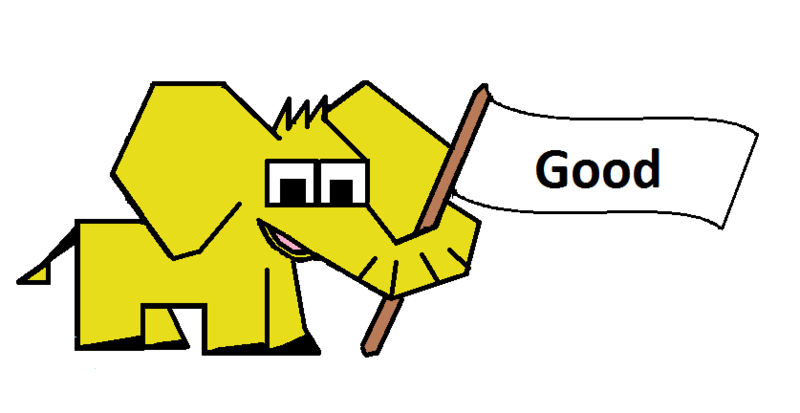 That´s all, and thanks to this, game is somewhere on the border of microgames. However, there are dice and cards are quite large and embossed, so this is maybe a little more of a classic dice game. 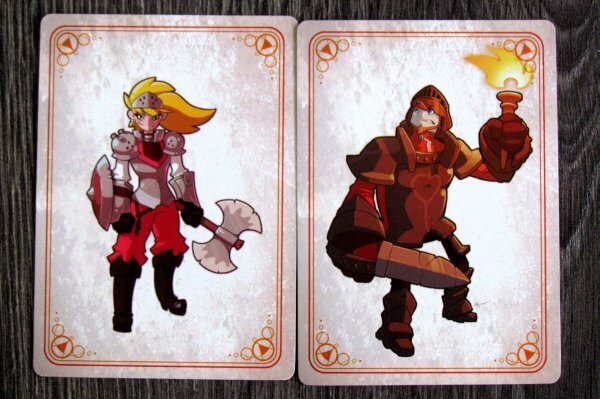 Looking at the card, you will probably be surprised that they contain no text, only the big picture heroes, heroines, monsters and maidens. 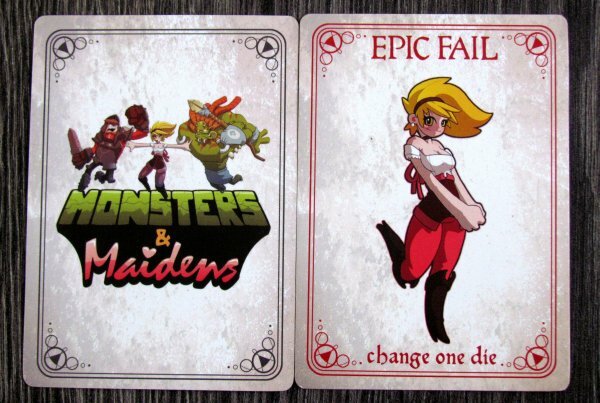 Only three cards of epic failure have at least one sentence allowing you to roll dice again. Dice themselves are wearing pictures of those three main representatives – innocent girls, monsters and their attackers. Beginning of each game is very simple, because players will not represent heroes individually, but as a team. Players will also need a pad with pencil to note gained points. 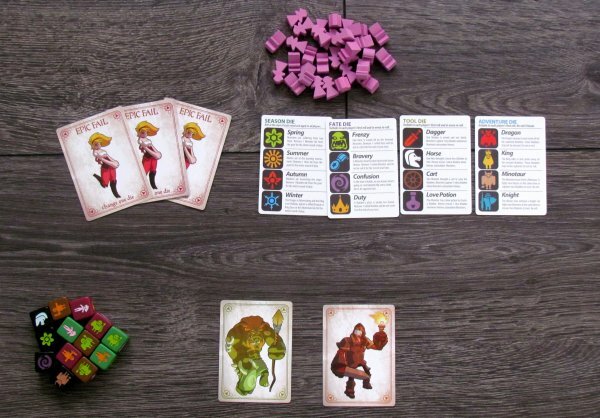 Only starting player puts a pair of cards in front of him lay – a hero and monster and also gets nine dice. All other players are currently watching empty handed, unarmed and without any options to save one of the beautiful girls. But do not be afraid, time will come for them as well with a little patience. 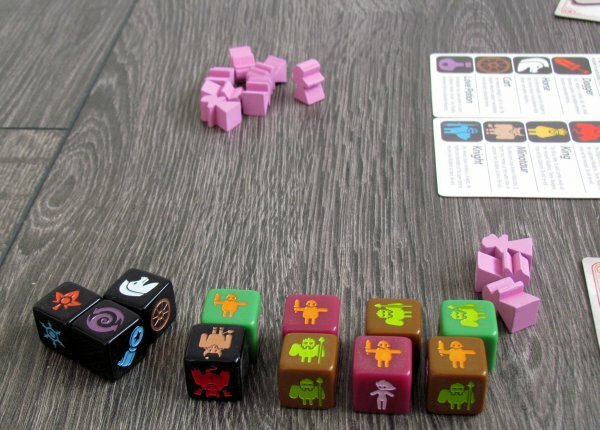 Active player takes nine dice and rolls them. Not on the enemy, but on the table. Already at that moment, he should feel appropriately heroically. This is the main reason, why all the pictures of pink virgins, that stay on dice after stopping, will mean successfully rescue of girls. Such dice are immediately moved to the heroes card. 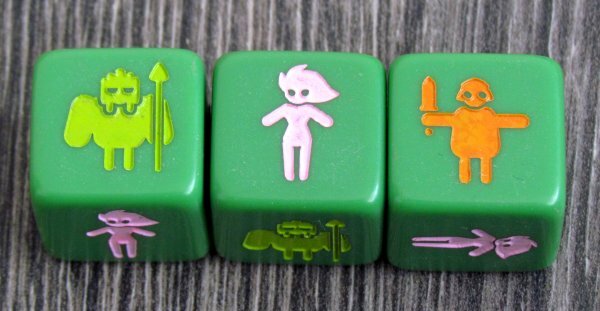 Pictures on the remaining dice are to be compared. Heroes has discovered monsters lair and now it is necessary to see, who has more agents in the upcoming battle – whether heroes or monsters. Each pair of monster-hero cancels each other out. As a result, either some monsters or conversely warriors will be left on the battlefield standing. 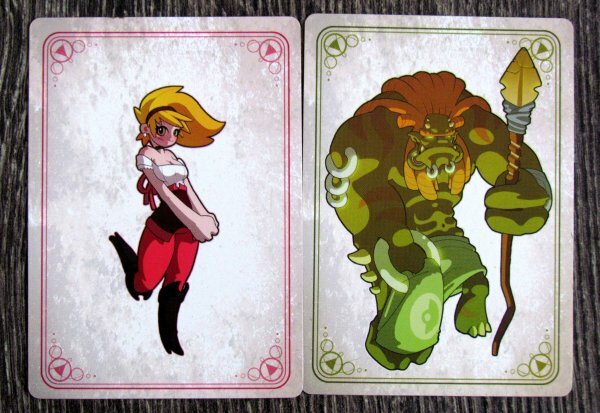 For each toothed monster, heroes lost one rescued girl, who is immediately moved from hero to monster card. 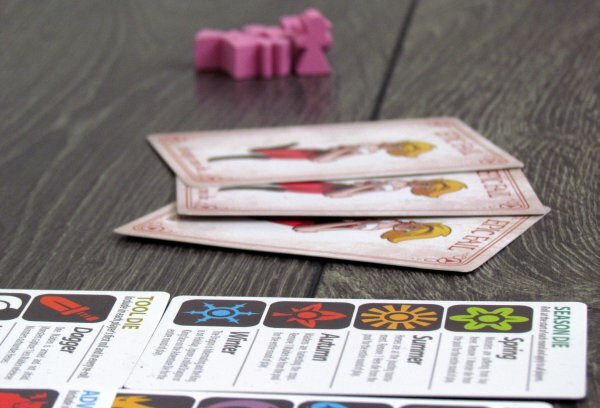 Conversely, if heroes are left, player can pull more princesses out of the lair. Remaining dice, that are not placed on monsters or heroes cards, can now be re-rolled. Or player may, anytime after evaluation, decide, that he is happy with current number of rescued virgins and happily retire to establish a harem. His success is written in his diary (points). Turn also ends, when all the princess are rescued (all dice on heroes card). Conversely, if the hero lost last rescued lass, his turn ends and no points are awarded. 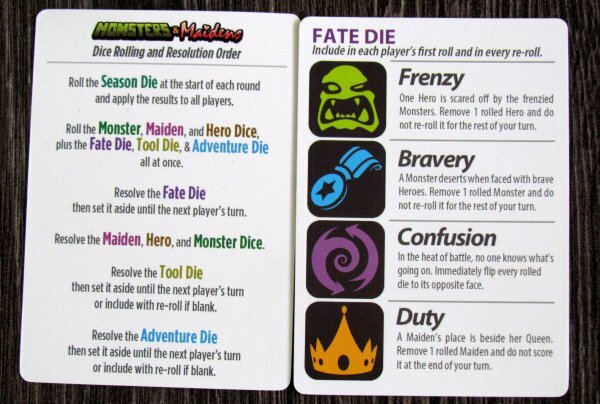 If player accidentally rolls with his very first roll of the dice outcome, that would immediately cause unsuccessful raid on the monsters lair (no virgins to be rescued), then player gets epic failure card as compensation. It may be used during the next round to change value of one dice in his favor. Heroes can very quickly become accustomed to success and one rescue is not enough for them. 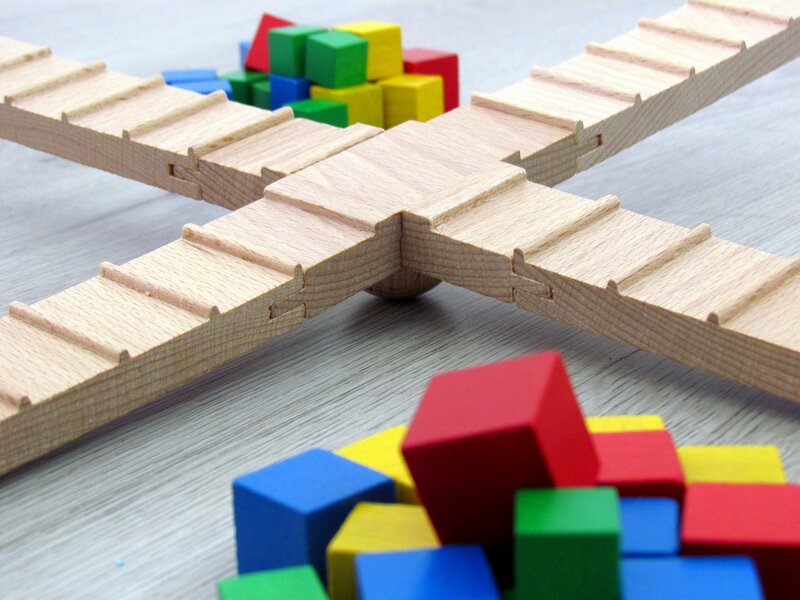 Therefore, game continues until any of players reaches a point barrier set on twenty times number of participants. That player is the winner. 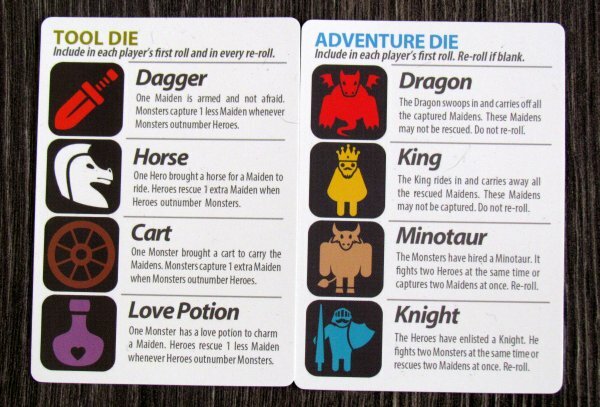 Monsters & Maidens are the dice-roling game, which in itself does not hide any secrets or surprises. Actually yes, sweeping picture on the cover and spectacular title will make you feel at first, like you were supposed to get something more. Game, which will be magnificent. 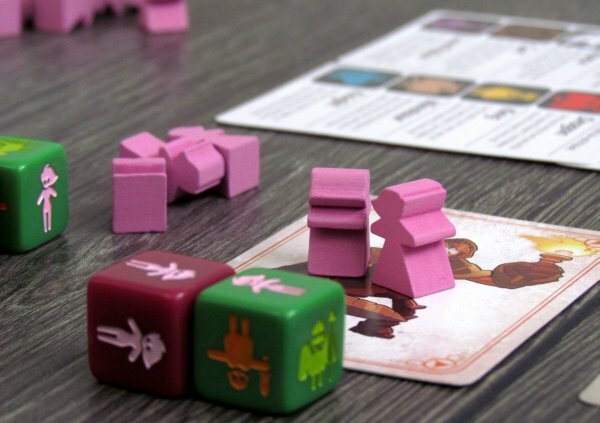 But initial disappointment can be overcome and enjoy simple and non-binding cube fun. This game will never be something more. Just a random light entertainment without a hint of tactics. Fun here is predominantly subject of dragging between monsters and heroes for virgins and your imagination. Players as such do not really have a chance to influence the outcome. This ranks the whole game into series “push your luck”. We thus can not conceal minor disappointment, because we were expecting at least some improvement, specialty, which makes this game a little different and unique. And besides processing, there is nothing like this. Game time corresponds to the concept of the game and does not exceed half an hour, but rather holds even in ten minutes shorter limits. Of course, there were many players, who had so much fun in our group. And this was, thanks to the topic, when we laughed and relaxed. And all that, although we have already tried many similar games. Still, this game has at least some spell, that will force you to take it from time to time to play. Lot of games with the same mechanism completely lacks this feature, such as Mr. Knizia games. 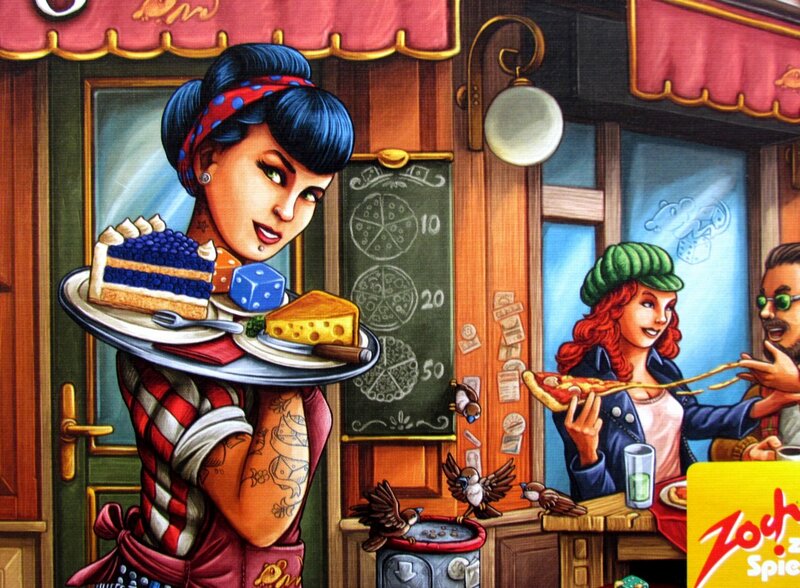 Overall, game will please fans of dice in this luxuriously prepared box. But others may be a little disappointed. But wait, do not turn away! We have good news also for these players – basic box does not stop there! By the time you play a game, it is time for an epic expansion. 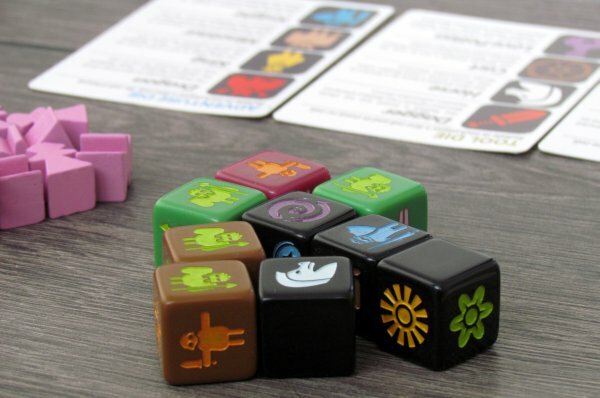 It offers four dice and the same number of cards describing the importance of icons on them. 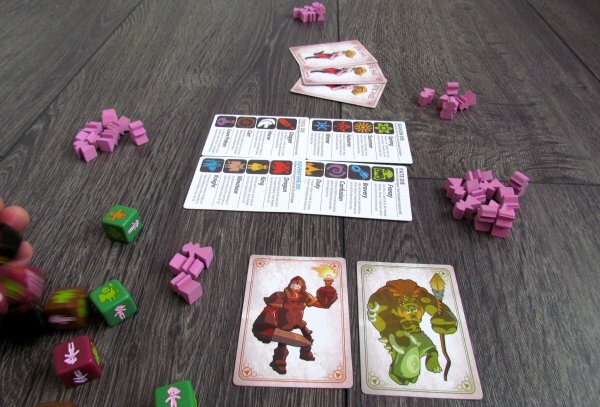 Seasons, tools, adventure and fate dice add other elements to the game and with them comes even better atmosphere. 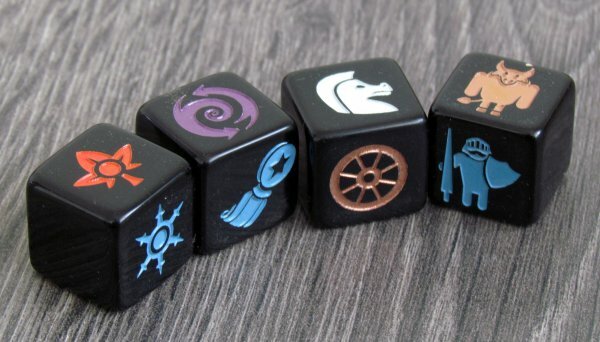 Their symbols affect number of dice to roll, as well as results of battles between heroes and monsters. 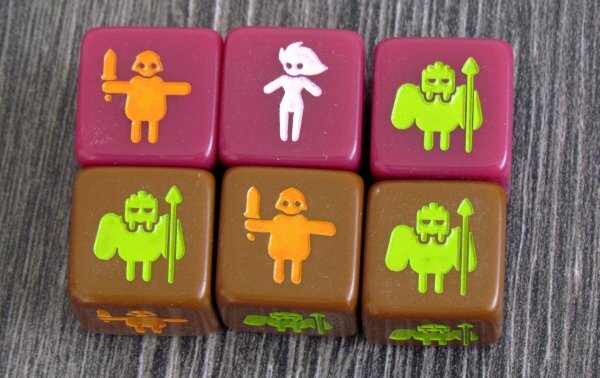 And with these dice, game is really fun! 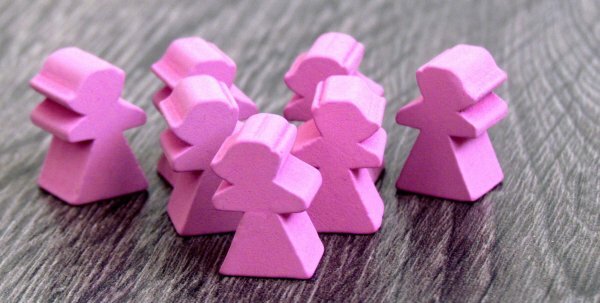 These dice are exactly something to move the game away from the crowd. If you are thinking about purchasing this game, then it does not make sense without this expansion. 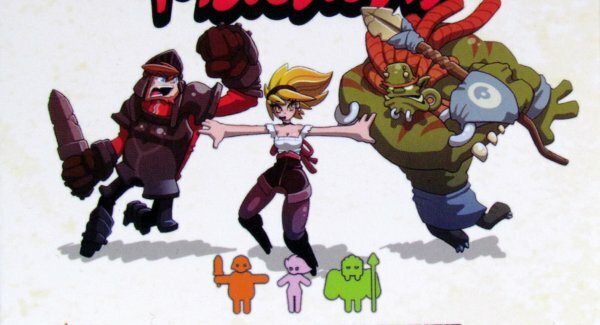 Monsters & Maidens is simple and on the first view an average game. Its saved from damnation and boredom by theme. Suddenly, you do not mind luck, because dice tells stories. Heroic and funny. Yet short enough to entertain you without sacrificing too much time. 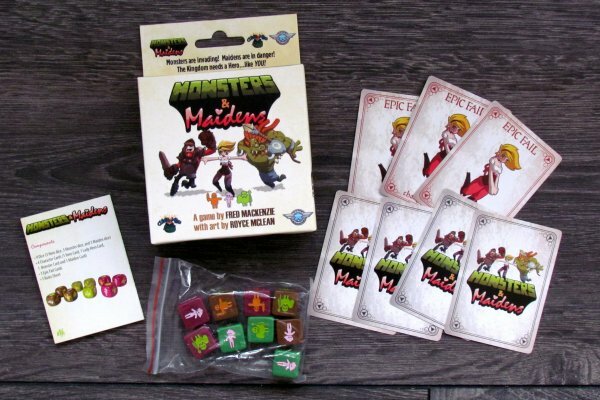 Monsters & Maidens are nothing more, than average game, but has great handling and offers excellent fun to properly tuned players. 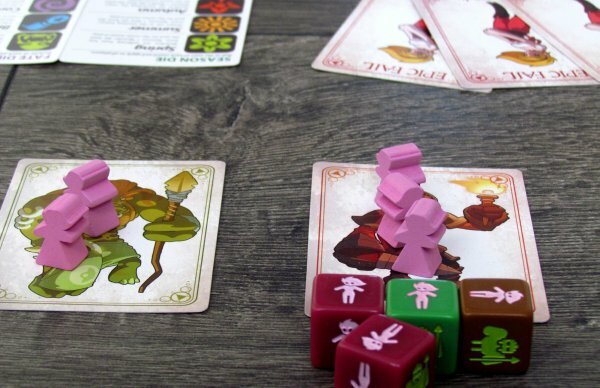 Monsters & Maidens is nothing more, than dice game with theme of pushing your luck. But at the moment, when seemingly defenseless virgins are supposed to be kidnapped by monster, they stabbed their tyrant in the leg instead and run. At that moment, you begin to enjoy the game, because of the short time frame tells funny and entertaining stories. Thanks to this game, you will laugh and have great fun. As a result, it is a game that depends solely on luck, without any chance to influence it. And mechanisms which were here already many times before. But why not admit it, when used properly with expansion, then we really hade fun with Monsters & Maidens.